Retired Lieutenant General Michael Flynn at the White House for his swearing-in ceremony. 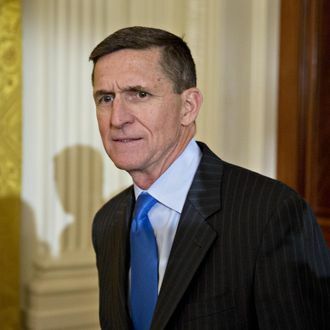 Just hours after retired Lieutenant General Michael Flynn was sworn in as Donald Trump’s national security adviser on Sunday, The Wall Street Journal reported that U.S. counterintelligence agents have investigated Flynn’s communication with Russian officials. McClatchy reported last week that the FBI, CIA, NSA, the Justice Department, the Treasury Department, and the office of the director of National Intelligence have been collaborating for months on an investigation into Russia’s alleged attempts influence the U.S. election. The probe looked at intercepted communications and financial transactions from several former Trump campaign aides, including Paul Manafort, Carter Page, and Roger Stone, according to the New York Times. Flynn is the first person working in the Trump White House to be linked to the probe. The Journal notes that it’s unclear if the investigation into Flynn produced any incriminating evidence, when it began, or if it’s continuing. A key point is said to be phone calls Flynn placed to Sergey Kislyak, the Russian ambassador to the U.S., on December 29, the same day President Obama expelled 35 Russian diplomats and imposed other sanctions in retaliation for Russia’s election hacking. As the Washington Post’s David Ignatius reported, the calls could constitute a violation of the Logan Act of 1799, which bars U.S. citizens from attempting to influence a foreign government involved in “disputes” with the U.S. (though the law is never enforced).